The emergency response tanks by GEI Works are durable and portable for use in disaster relief efforts. 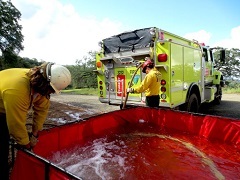 In addition to firefighting water storage, in a natural disaster, these water storage tanks can be made with potable safe liners to provide clean drinking water during natural disasters such as wildfires, hurricanes and floods. 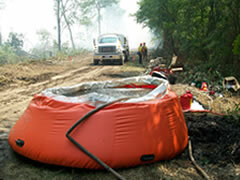 GEI Works Fire Suppression Tanks are ideal water storage solutions for emergency response and disaster relief situations. Manufactured with quick set up and mobility in mind, Hydrostar Onion Tanks, Centaur Frame Tanks, and Argo Water Trailers are capable of either holding water for use or delivering water on-demand to stop brush fires, maintain prescribed burns, stop wildfires, and bring other emergency situations under control. These water storage tanks can be used for other applications such as dust suppression, drinking water storage, decontamination showers, hazardous material containment, and other liquid containment. Are you in need of a liquid storage tank for emergency response situations? Call 772-646-0597 or request a quote. Hydrostar onion tanks are a self-rising, quick-fill solution for emergency water storage. The flexible design of Hydrostar Onion Tanks makes them an ideal portable solution and offer easy storage. The perfect auxillary water storage option for firefighting, Centaur Frame Tanks fold open for quick deployment and can be manifolded together to expand available water reserves. Wherever you go, Argo Water Trailers follow in tow. With every tool included or built onto the trailer, these water trailers provide water storage and dispensing in any navigable location.